Throughout my career, I’ve had the opportunity to work with a number of companies to develop Corporate Social Responsibility (CSR) strategies that focus on creating value; value for the companies AND value for communities and society. Through these interactions and experiences, I have noticed an interesting and often detrimental pattern. 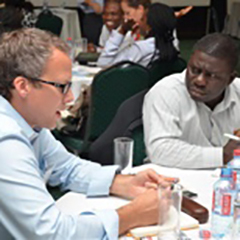 Initially leaders of these companies often fail to pursue CSR planning from a business perspective. In any other area they would make a business case for taking any action, yet that same accountability is not always present when it comes to CSR. Leaders would realize that there was an expectation from customers, employees, regulators and other stakeholders that there business should make a contribution to society. Responding to this expectation they would look outside of their business, searching for a societal or social need they could help to meet and then make plans to contribute to it. All good. Right? WRONG. Contributing to society is only part of what they need to consider when developing CSR plans. They also need to look to the needs of their business and see how they can align the two. How they can create social value and shareholder value simultaneously? In order to be successful, it is crucial to apply the same amount of value-focused scrutiny to your business’s CSR efforts as you do with other aspects of your work. Whether you have an entire department dedicated to CSR, or the responsibility falls to your employees in corporate affairs, those working on these efforts should be held to the same standard of accountability, the same level of reporting, and the same level of value creation. 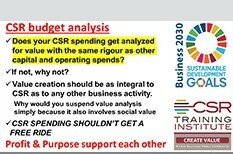 CSR budgets need to be as accountable to shareholder value as any other budgets and plans. CSR is not something that can be thrown together without planning. No more than you would throw money at other operating or capital budget areas without planning. You must always strive to create real value for business, community, society and the environment. When it comes to CSR planning, I still see budgets that are approved based on numbers that don’t consider shareholder value creation. This would never be accepted in other areas of business, yet it happens so frequently with CSR. If those responsible aren’t taking the CSR initiative seriously, how will anyone else? When businesses do not expect the same level of work and dedication toward CSR as other aspects of their operations, they allow strategies and planning to get sloppy – allowing waste and inefficiency to creep in. If you are interested in learning more about how a value-centric strategic approach to CSR can help your business or organization leverage social capital to deliver more value, send me an email at wayne@csrtraininginstitute.com.